Then around five years ago, things turned on the sculptor. His marriage collapsed, the rising tide of success became a tsunami of grief, and now it was Cajero who was a lump of clay being pounded by bills on an artist’s pay. 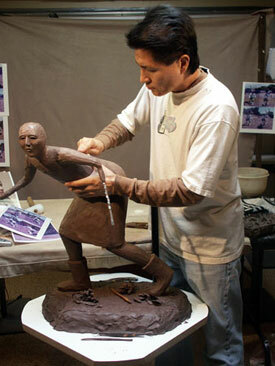 Joe Cajero works on one of his koshare pieces, a jester figure used in the sacred dances. Until then, he had been something of a golden boy, raised at Jemez Pueblo by a painter father and potter mother who held prominent positions in the Indian community; his own ease with drawing had landed him at the Institute for American Indian Arts and top prizes at Indian Market from the age of sixteen. The result of his search, an abstracted figure he called “Embodiment of Prayer,” launched a new direction for Cajero that straddles the divide between freedom from tradition and freedom to express it. Abstraction, he found, let him move easily between the conscious and subconscious, from the sacred ceremonies he learned about on the Towa-speaking pueblo, to his attempts to apply those disappearing resources to his modern struggles. Bronze also opened up a palette more brilliant than the earth pigments used in Pueblo pottery. Cajero quickly moved to the next level, sculpting a series of four abstract pieces that have been cast as large as seven feet and shipped to destinations around the country. This year he got his first commission: two running figures, several times life-size, for the Jicarilla Apache Tribal Council building, to be unveiled in October. He laughs at the memory of standing helplessly before the monumental figures with his small clay tools, until someone handed him a saw. 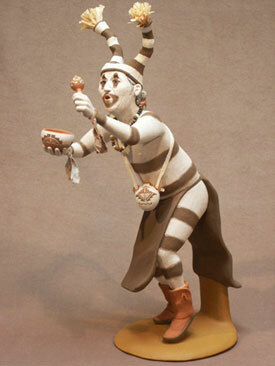 A koshare piece, by Joe Cajero. Three years ago, he also found love where he did not expect it?with an old friend who had commiserated with him through his divorce. Althea Cajero, of Acoma and Santo Domingo pueblos, took up jewelry-making after they married and shares a booth with her husband at Indian Market. In their world, art-making is not an activity easily segregated from the rest of life?family, tradition, culture, spirituality, and modern standards of survival and success. Cajero draws heavily on his memories of the last generation to experience the sacred ceremonies firsthand?his great-grandfathers’. And the greatest gift given to him as an artist, he says, is still his father’s withholding of approval. As skillfully as the young boy painted, his father never said to him, “Great job.” Instead, he would show him what was off, and how to fix it. “That gave me drive?that’s what drives me today?because there’s nothing wrong with the image in my eyes,” laughs Cajero, a figure so lively and at ease that it’s clear he spends a lot of time both outdoors and among friends.